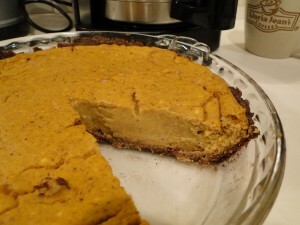 I had a request for how I would make a lower sugar, lower carb pumpkin pie for the fall holiday table... maybe for Thanksgiving, Fall Equinox, a Harvest Fest... you decide when and whip up a tasty, whole food pie treat. Here is how I make my yummy Autumn pumpkin pies. Enjoy! Pie Filling: You can also use a butternut or buttercup squash. 1 (15-ounce) can no sugar added pumpkin filling, organic of course. To cook your own pie pumpkin, see below. Mix all crust ingredients together in a small bowl. While mixture is still warm from the butter, press it evenly into the bottom of a deep-dish pie pan. Bake for about 5 minutes, or until browned. Remove pie crust from oven. Place all filling ingredients in a medium bowl and mix well with a wire whisk. Pour filling into your pre-baked pie crust. Bake for 15 minutes and then reduce the oven temperature to 350 degrees F.
Continue to bake for an additional 50 to 55 minutes. To test to see if cooked enough, stick a sharp knife in the center; if it comes out clean, the pie is done. To serve, top each slice with a dollop of low carb whipped cream. 1-3 tsp. vanilla extract, I tend to go for the more is better, you do not miss the sugar when you add vanilla, maybe a dash of cinnamon too! Cooking your own pie pumpkin: I take the whole little pie pumpkin and put it in a pot with about 1 inch of water in the pot. Cover, bring to a boil, and reduce heat to a very gentle simmer. Check in 30 minutes, if a sharp knife slides into the flesh easily, it is done. I carefully remove it from the pot and put it in a bowl or plate with upturned edges. Cut into pieces and puree the whole pumpkin: seeds, skin, and all. A blender works best. Use what you need for the pie and make curry pumpkin soup with the rest! Curry Pumpkin Soup: This is as easy as putting the rest of your pie pumpkin in the blender with milk* (add enough milk to blend the pumpkin into a puree and then add what you need to get the thickness you are looking for in a creamy soup) and adding your favorite blended curry spice to your taste. Blend, heat, enjoy! *I suggest using butter, eggs, and whipping cream be from animals raised naturally: grass fed cows and chickens foraging for their own natural foods.